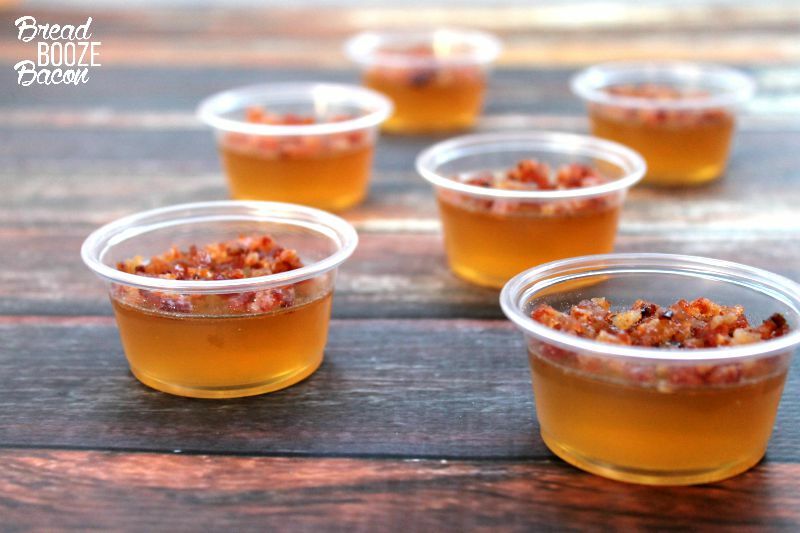 Bacon Bourbon Apple Jello Shots are the best late summer party starter! 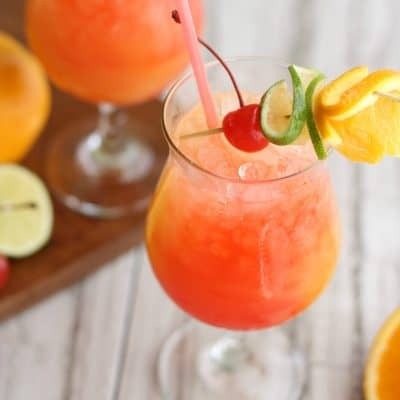 They are the perfect way to cool you down after a hot day of playing in the sun! What goes better together than pig and apples? Not much! That was the inspiration for these unique jello shots. 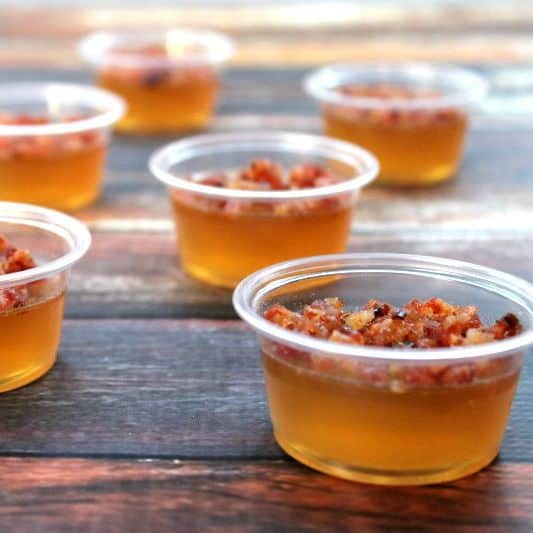 A little bacon, a little bourbon, some apple juice and you are in apple jello shot heaven! These babies are the perfect summer to fall transition shot. 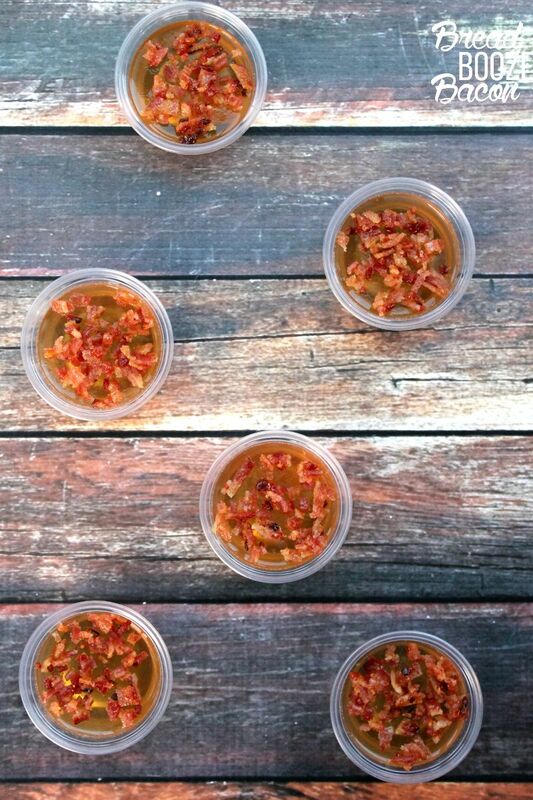 If you’re thinking I’m weird for putting bacon on a jello shot, you my friend have not lived! This isn’t just your regular old crumbled bacon. This is sweet and salty, homemade candied bacon that’s freaking amazing with the vanilla and caramel notes in the bourbon. My friend Phil even said these were the best jello shots he’s ever had. Yeah. 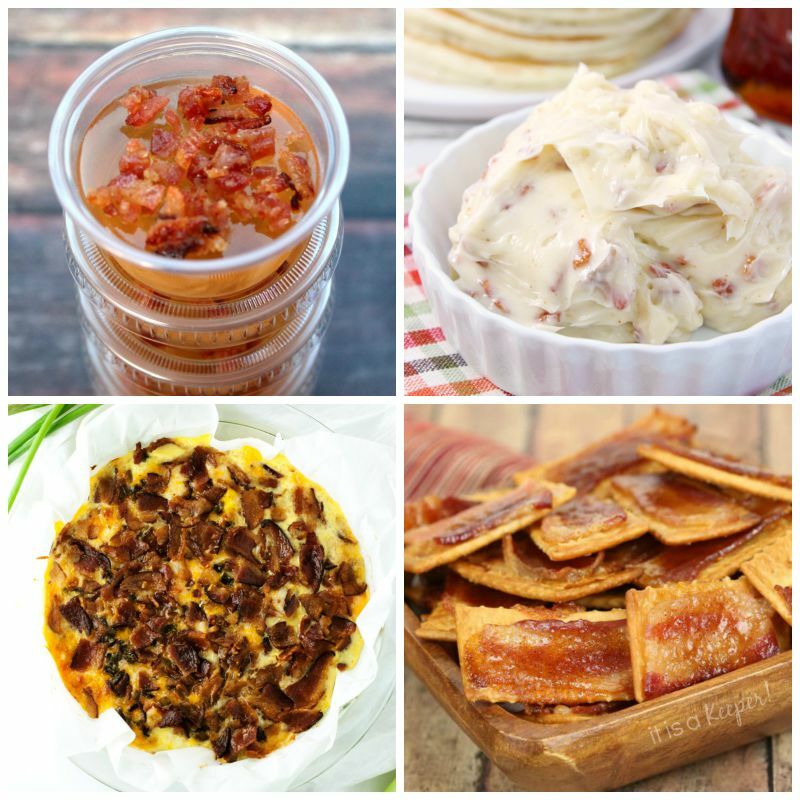 See some more of the bacon goodness going on today for Bacon Month by checking out the links below! 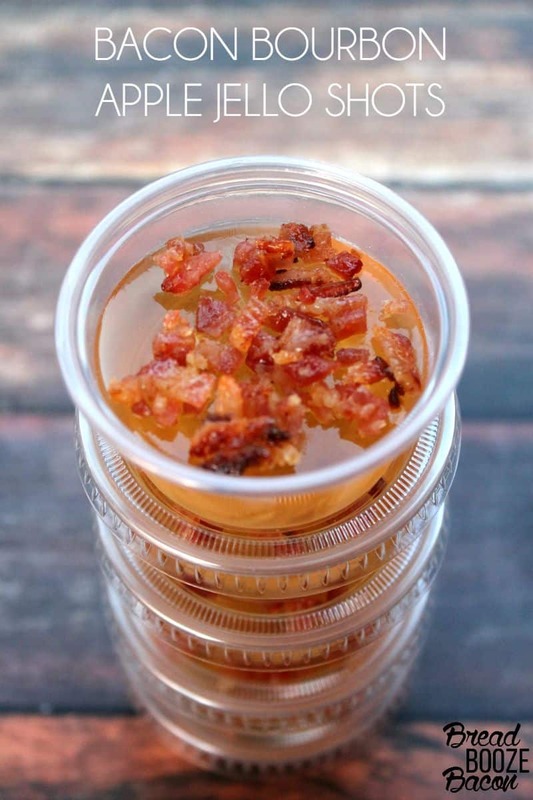 Place bacon chunks and bourbon in an airtight container, like a mason jar, and let sit for 3 hours on the counter. Remove bacon, recover container, and place in the fridge for 2 hours to solidify the fat from the bacon. Strain bourbon through a fine mesh sieve. Set aside. Pour the gelatin into a medium mixing bowl. Add cold water and stir to combine. Let sit until all the gelatin has been absorbed. Add boiling water, and whisk until gelatin has dissolved. Add brown sugar and whisk until dissolved. Pour in apple juice and bacon-infused bourbon, stir to combine. Pour the apple juice mixture into the plastic cups, distributing it evenly, and filling until just about to the top. Place the baking dish in the refrigerator for 6 hours, or until the jello has set. In a small bowl combine the brown sugar and cayenne. Pour onto a plate and spread into an even layer. Lay the bacon strips on top of the brown sugar, and press down to coat the bacon. Flip the strips over and repeat. You want a good coating of sugar. Lay the bacon on the prepared baking sheet. Bake for 7 minutes, carefully flip the bacon over and bake for another 5 minutes. (Watch the bacon so it doesn't burn!) Remove from the oven. Transfer the bacon to a plate coated with non-stick cooking spray and let rest until cool. Chop the bacon into tiny pieces (think bacon sprinkles). 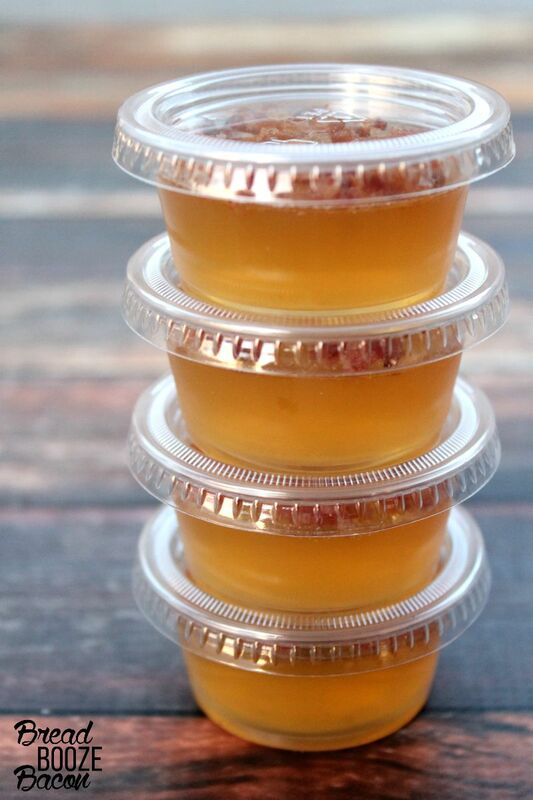 Pour about 1/2 teaspoon crumbled bacon on to each jello shot and spread into an even layer. Place a plastic lid on each cup and store in the fridge until ready to serve. This looks great! Do you put the bacon on top before or after the jello sets? I put the bacon on after the jello sets. Since the bacon is candied it doesn’t get chewy in the fridge. I have a bourbon whiskey blend, would that work? Hi Traci! Any whiskey, bourbon, or blend you enjoy should be fine. I wouldn’t use Scotch though. Sorry, Nope. Followed directions to a tee….worst jello shots I’ve ever had…had to toss them all….Super bummed bc they looked amazing. And for some reason it only let’s you leave 5 stars and no less. Why? Was it a texture thing or a flavor thing? This is a great recipe but needs some clarification. The bacon infused bourbon is a pretty potent flavor profile. 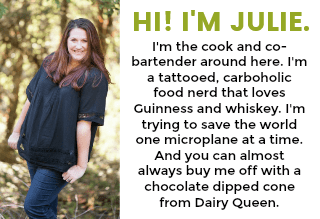 I only added it to the jello mixture by the spoonful until I got the blend I liked. If you pour it all in and are not used to drinking bourbon then it will be too strong. Next time I will substitute the water in the jello mixture for apple juice. The jello seemed a bit bland and was needing more apple flavor once everything set up. Some small tweaks and I will use this in competition as it has everything – sweet, salty, smoky, good textures, and a little heat.